We go through the mistakes 80% of people make which leads them to failing the PMP on their first try, highlight appropriate study material and a complete study plan for you to follow. If you require PDUs or looking for extensive training we recommend our partner PMTraining. This PMP study guide was created to a single source of all the information you need to acquire you're PMP qualification. PMP® exam is a Project Management Professional certification by the Project Management Institute (PMI®). PMP® is globally recognised with members in 193 countries. Having a PMP® demonstrates the experience, education, and ability to lead and direct successful projects. Most project manager positions in top companies require PMP® qualification and if not it is seen as a distinct advantage to have the qualification. All information regarding PMP® can be found here in the PMP© Certification Explained article. Credibility: The Project Management Institute (PMI®) was founded in 1969 and since the 1980's have been making efforts to standardise project management procedures and approaches. 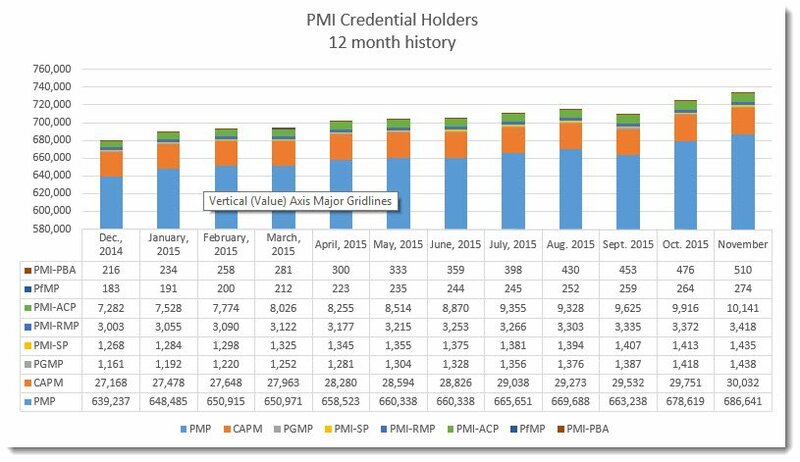 You can see the amount of PMI® credential holders in the below table. Competitive Advantage: PMP® certification holders will have a distinct advantage over other project managers in the work place not only in knowledge but also salary. Check out the latest project management salary survey from 2015. Signup to Project Management Institute (PMI). You can become a member which will save you $140 for the exam and give you a discount if you need to repeat. You do not have to be a member to take the exam. Complete 35 hours of formal project management training. Submit your pmp application outlining you'r work experience and education. If approved book exam with Prometric. If not approved you will be subject to an audit. The pmp certification requirements are quiet extensive as it requires formal education and a number of years experience. The requirements in the Project Management Professional (PMP) Credential Handbook states that a candidate must “Document 35 contact hours of project management education”. This requirement is for all candidates no matter of previous experience. There is a very good chance you don’t have any formal project management education. If this is the case you need to make sure the course you pick goes towards formal project management education that is reconsigned by the PMI®. Depending on your college background you might already have project management experience complete in a module. Also you might have completed training in the work place in project management which can also be counted. It is well worth checking any previous training with the instructor to see if it qualifies. The first step is to document all education hours regardless if you think they contribute or not. There is no expiry date or a restricted time frame to have completed education hours. The second step is to classify the education type received. *Note that the PMI defines “one contact hour is equivalent to one actual hour (60 mins) of training or instruction received”. NOTE: One hour of classroom instruction equals one contact hour. If you have completed a university or college course on project management that met for three hours per week for 15 weeks, you would record 45 contact hours. If only a portion of a course dealt with project management, only the hours spent on project management can be applied toward the total. 35 contact hours can be met by completing courses, workshops and training offered by one of the following types of providers…..
PMI Registered Education Provider (R.E.P): These are pre approved courses by PMI. PMI Component Organizations: Theses are PMI Chapter training, specific interest groups. 3rd Party Distance-learning Companies: Can include live instructor training online or just online video course. As long as content can be logically mapped to knowledge areas. What doesn’t satisfy PMP Education Requirements…..
PMI Chapter meeting unless spent time learning an activity. The PMP audit scared the crap out of me when I was applying for the PMP examination. I spent 3 months working on my application where I mapped out every bit of work experience. I then wrote up paragraphs on each of projects, broken down by process group (initiation, planning, executing, monitoring & controlling and closing). After that I spruced them up with project management terminology and finally sent them off to my manager at the time.I did this all as precautionary you don’t need the managers to approve them before you submit them but if you get audited the mangers will need to approve them. I explain why it took me 2 months longer than it should of at the end! When you submit your application for any PMI© examination you are agreeing to comply with the terms of the PMP audit process. Everyone’s application is eligible to be audited but only a percentage are selected. The selection of an application for the audit is at random but reading blogs there are theories on how to avoid getting audited. I have read that the following tips on trying not to get audited. Not to repeatedly modifying your application and saving as it could set off a flag. Not to be changing numbers for hours experience as it seems you are fixing the numbers for your convenience. Do not differentiate from recommended percentages per process group. The percentages are Initiation 5% to 10%, Planning 20% to 30%, Executing 20% to 30%, Monitoring & Controlling 20% to 30% and Closing 5% to 10%. I didn’t follow this as for some projects all my work was closing so gave more than recommended percentage. I created a tracking sheet to help track the projects I managed to calculate hours per project and to align dates. No need to include every project as long as you have covered each domain at least once. Initiated, Provided, Estimated, Performed, Measured, Managed, Analysed, Acquired, Distributed, Requested, Selected, Verified, Reported, Administered, Contracted, Communicated, Closed. Below is all the required information you need to provide per project. The description should include examples of how you led and directed this project. Ensure that your description is between 300 and 550 characters. This is not the end of the world and just needs you to verify the information you provided. You will know if your application is selected for an audit straight away. You will be notified by email after payment of the examination fee is received. The email will also provide further details on the audit and the next steps. You have 90 days to provide the above documentation either by regular post or express courier service in ONE envelope to the following address…. The audit should take about five to seven business days to complete. Once you pass the audit you have one-year to complete the examination. You should not be failing the audit process if all the information you provided is correct and accurate. Please note though incomplete audit submissions will not be processed and will result in failure of the audit. You will receive a refund of your fee if you do fail. Please see Refund Policy on the PMI website for more details. Also if you fail you cannot apply for the PMP for one year. What is the pmp certification cost? PMP® certification cost is not the only thing you need to take into consideration when committing to PMP© certifiaction cost. The PMP© requires a lot of effort and should not be considered a quick and easy qualification. Applying for the PMP© is free but you need to meet the requirements to apply. One of the requirements is having 35 contact hours of project management. I personally had completed a Computer Management Module in Bachelors Degree so didn’t have to attend any extra classes to qualify. If you haven’t any previous project management education this is going to cost you money. To sit the actual PMP© examination its costs $405 for PMI© Members and $555 for Non-Members. To repeat the exam it costs $275 for Members and $375 for Non-Members. The membership itself cost $139 but for the PMP® examination being a PMI® member saves you $150 immediately. There are also the following benefits…. There is a yearly fee of $129 to maintain your membership. If you are serious about your career in project management it is recommended to become a PMI© Member. This will enable to participate in local chapter meetings and contribute and get reconsigned in the world of project management. 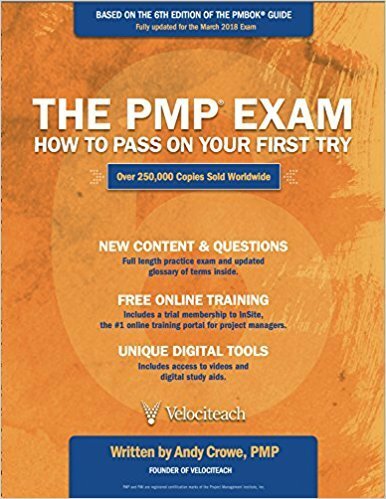 To attempt the PMP examination without membership costs $555. To apply for the PMP© you need to prove you have completed 35 hours of project management education. This will cost you money but you can combine this cost with study material and use it as preparation for the exam. The PMP preparation courses will clarify if they can go towards the 35 hours required to apply. PMBOK© Guide costs $47.98 but is free to download from the pmi.org for PMI© members. 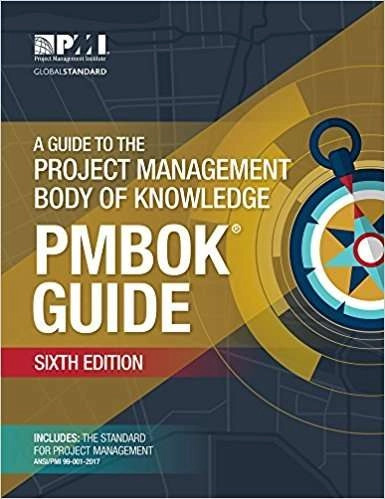 Reading the PMBOK© isn’t compulsory and some qualified project managers have revealed they passed the exam without reading the PMBOK but you will feel more prepared if you have read it. Also the PMBOK© is a guide or reference point on techniques and processes that can be used in day to day project management and is a great tool to have in your arsenal. There are a lot of free exams you can find online but there is also a number of private examines you can take. You will be attempting the PMP© exam in a pro-metric centre. For those knew to this environment you need to know they are very strict and take it very seriously. Items prohibited from the Testing Center include…. You will also be searched before you enter the surveillance room where you will be assigned a cubicle with just a computer screen, a mouse, paper and a pencil. If you have belongings with you there will be a locker you can use. Navigate to website (www.prometric.com/pmi) and select the “I want to….” on left hand side option for PMP,PgMP, PfMP, PMI-SP and PMI-RMP. *I suggest you give yourself at least 6 weeks of study time. I go through my study plan outlining how long it takes to get through the study material. Firstly you should know by now but to make sure you know what to expect. There is a total of 200 questions with only 175 being counted towards the actual mark the other 25 are PMI review questions. The PMI uses the 25 review questions to test new questions to see responses from test takers. You will not be able to distinguish the difference between real and review questions in the exam so it is best to practice full length exams of 200 questions. The PMBOK® Guide also provides information on the PMI® Code of Professional Conduct which is also tested ion the exam. Below I have broken down all the different terms and definitions you should understand per process group. DO NOT JUST READ PMBOK - YOU WILL FAIL. Having the correct PMP® study guide is essential. I made the costly mistake of only reading the PMBOK® Guide first time round and wasn’t till after failing I learned how much of a rookie mistake it was. The PMBOK® Guide is a manual/guide on the PMI® approach to project management and the PMP exam is based on it. The PMBOK® Guide is not a manual/guide on how to pass the PMP® exam. The PMP® exam is multiple choice but the questions are situational and the PMBOK® Guide does not prepare you for such kind of questions. The questions are not easy and phrased to confuse people for this reason you need other resources to help you pass that prepare you for these questions. The Project Management Professional (PMP®) is a lot to take on by yourself so it is advised to sign-up to professional training to help you pass the exam. As noted above it is not sufficient to just read the PMBOK® Guide as it is just a reference guide. You also need other resources to complete your preparation. Most resources prepare applicants by match their content as the chapters in the PMBOK® Guide and provide questions related to the exam. The two books I highly recommend which both include full-length practice exams with detailed explanations….. If you are completely new to studying project management I recommend Head First PMP but if you are familiar with the knowledge areas and process groups Andy Crowe’s will be a perfect fit. Head First should be seen more as a beginners book and Andy Crowe’s more advanced but they both compliment each other. 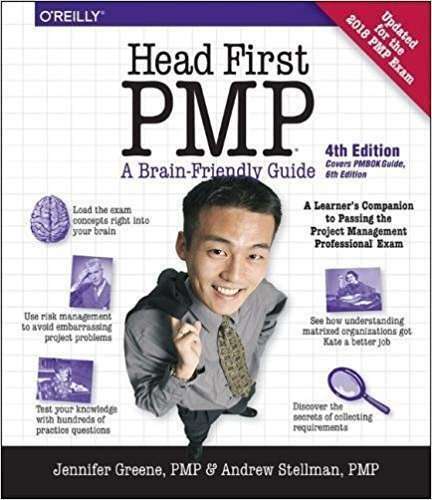 Head First PMP gives a brilliant introduction using real examples and Andy Crowe’s is more similar to the PMBOK but easier to digest and more focused on helping you passing the exam. Rita Mulcahy was given to me by a student one day when I was teaching PMP and I was quiet impressed by it. Originally I read it was very techy but didn't seem like that at all. After reading it I would rank it alongside Andy Crowes book. If you buy with Amazon you get bonus study material though. 1. Read through one book mentioned above. 2. Take the adjoining exam at the back of the book. 3. Keep these results for the night before the exam. 4. Read through the below lists of process groups and ensure you are familiar with each term and concept. 5. Set out a daily routine of creating the process group map & formulas including Earned Value Management. 6. Schedule time to take other tests online and record scores. Make list of any terms/concepts you get incorrect. 7. Repeat till you have done all exams. Aim to be getting 70%+ in each. 8. Night before take exam you took in step 1. 9. Relax and make sure to follow the exam day plan. Take your breaks it gives brain chance to regroup. To learn an easy way to remember all of the 47 process to create a table check out this article. On January 11th 2016 the PMI added tasks 2, 7 and 8 to the list of expected tasks in the Initiation phase. You can read the impact of these tasks additions here. Assess project based on available project information, lessons learned documents from previous projects and meeting relevant stakeholders. Support the evaluation of the feasibility of new products or services within the given assumptions/constraints. Identify key deliverables based on business requirements. Perform Stakeholder Analysis to align expectations and gather support for project. Align expectations and gain support for project. Propose an implementation strategy for the project. Develop the Project Charter and ensure stakeholders are in agreement with its contents. Ensure project stakeholders are in agreement on its elements. Obtain Project Charter sign-off from project sponsor. Formalize the authority assigned to the project manager. And gain commitment and acceptance for the project. Conduct benefit analysis with relevant stakeholders. Validate project alignment with expected business value and organization strategy. Inform stakeholders of approved project charter. Manage expectations on key deliverables, milestones and their roles and responsibilities. While I was studying for the PMP exam I kept a list of terms and definitions on the Initiation phase for studying purposes. I turned this list into a study list to test myself by domain same as the exam is structured. This is my own personal list and not a definitive list. If you have suggested or additions for the list please provide them in the comments section and I will update the list accordingly. On January 11th 2016 the PMI added task 13 to the list of expected tasks in the planning phase. You can read the impact of these tasks additions here. Task 1 Review and assess detailed project requirements, constraints and assumptions with stakeholders based on project charter and previous projects lessons learned Establish detailed project deliverables. Task 2 Develop scope management plan, based on the approved project scope. Define, maintain and manage scope of project. Task 3 Develop the cost management plan based on project scope, schedule, resources, approved project charter and other information. Manage project costs effectively. Task 4 Develop the project schedule based on the approved project deliverables, milestones, scope and resource management plans. Manage timely completion of the project. Task 5 Develop the human resource management by defining roles/responsibilities of the project team members Create a project organizational structure and determine how resources will be assigned and managed. Task 6 Develop the communications management plan based on the project organizational structure and stakeholder requirements Define and manage flow of project information. Task 7 Develop the procurement management plan based on the project scope, budget and schedule. Ensure that the required project resources will be available. Task 8 Develop the quality management plan and define the quality standards for the project and its products based on scope, risks and requirements. Prevent the occurrence of defects and control the cost of quality. Task 9 Develop the change management plan by defining how changes will be addresses and controlled Track and manage change during the project. Task 10 Develop the risk management plan by identifying, analysing and prioritizing project risk. Create risk register and define risk responses. Manage uncertainty and opportunity throughout the project. Task 11 Present the project management plan to relevant stakeholders according to organization policies and procedures. Obtain approval to proceed with project execution. Task 13 Develop the stakeholder management plan by analysing needs, interests and potential impact. Effectively manage stakeholder’s expectations and engage them when required. While I was studying for the PMP exam I kept a list of terms and definitions on the Planning phase for studying purposes. I turned this list into a study list to test myself by domain same as the exam is structured. Knowledge Area Do You Understand…. Integration Management What are the Configuration Management activities? Scope Management Describe the following product analysis techniques: Product breakdown, System Analysis, Requirements Analysis, Systems Engineering, Value Engineering, Value Analysis. Cost Management What is difference between contingency reserve and management reserve? HR Management What does RACI stand for? HR Management What is difference between resource smoothing and levelling? HR Management What is staffing management plan? Communication Management What so the halo effect? Risk Management What is a Risk called that doesn’t have a negative impact? Risk Management What is the difference between special and normal causes? Risk Management What does SWOT stand for? Risk Management What is the purpose of a watch list? Stakeholder Management Define 5 types of engagement a stakeholder is? In January 11th 2016 the PMI added tasks 6 and 7 to the list of expected tasks in the Executing phase. You can read the impact of these tasks additions here. Task 1 Acquire and manage project resources by following procurement and human resources plans. Help meet project requirements. Task 2 Manage task execution based on project management plan by leading and developing the project team in order to achieve project deliverables. Hep achieve project deliverables. Task 3 Implement the quality management plan to ensure work is performed in accordance with required quality standards. Ensure that work is performed in accordance with required quality standards. Task 4 Implement approved changes and corrective actions by following change management plan. Help meet project requirements. Task 5 Implement approved actions by following risk management plan in order to minimize the impact of the risks and take advantage of opportunities on the project. Minimize the impact of the risks and take advantage of opportunities on the project. Task 6 Manage the flow of information by following the communication plan to keep stakeholders engaged and informed. Help keep stakeholders engaged and informed. Task 7 Maintain stakeholder relationships to receive continued support and manage expectations. Ensure the project receives continued support and expectations are managed. While I was studying for the PMP exam I kept a list of terms and definitions on the Executing phase for studying purposes. I turned this list into a study list to test myself by domain same as the exam is structured. Quality Management What is a Quality Audit? Quality Management Who created Plan-Do-Check-Act? Quality Management What is Kaizen? Quality Management What is just-in-time? HR Management When would you use preassignment? HR Management Who created the Hygiene theory and what is it? HR Management What are the 3 factors on McClelland’s Motivational Needs? HR Management What roles under mind the Project Management implementation? HR Management What are the 6 ways to resolve conflicts? HR Management What is the most common conflicts? HR Management Why are unresolved issues a major source of conflicts? HR Management What is purpose of ground rules? HR Management What are the categories of cultures managers should master? HR Management What is a war room? Communications Management What is the purpose of Managing Communications Process? Communications Management Work Performance Data gets turned into? Procurement Management What is an Information Management System? Procurement Management What is an cost0-reimeburasable type contract? Procurement Management Who attends a bidder conference and when is it held? Procurement Management What is the purpose of Conduct Procurement Process? Procurement Management Difference between Plan and Conduct Procurements? Procurement Management Why would you use independent estimates? Procurement Management What are the outputs of Conduct Procurements? Procurement Management Define Procurement Documents? Procurement Management Define a win-win situation? Procurement Management What is an ideal situation for every contract? Stakeholder Management What is the purpose of Manage Stakeholder Engagement? Stakeholder Management Who leads negotiations? In January 11th 2016 the PMI added tasks 6 and 7 to the list of expected tasks in the monitoring and controlling phase. You can read the impact of these tasks additions here. Task 1 Measure project performance in order to identify and quantify any variances and corrective actions Identify and quantify any variances and corrective actions. Task 2 Manage changes by following change management plan Ensure the project goals remain aligned with business needs. Task 3 Verify project deliverables conform to quality standards established in quality management plan Ensure the project meets requirements and business needs. Task 4 Monitor and assess risks by deterring whether exposure has changed and evaluating the effectiveness of response strategies. Manage the impact of risks and opportunities on the project. Task 5 Review the issue log, update if necessary and determine corrective actions. Minimize the impact of issues on the project. Task 6 Capture, analyse and manage lessons learned management techniques. Enable continuous improvement in the project. Task 7 Monitor procurement activities according to the procurement plan. Verify compliance with project objectives. While I was studying for the PMP exam I kept a list of terms and definitions on the Monitoring and Controlling phase for studying purposes. I turned this list into a study list to test myself by domain same as the exam is structured. Integration Management What is the process of creating a change in a project? Integration Management What is a work performance report? Integration Management Change Controls are used for what? Integration Management Difference between change and defect? Integration Management Difference between corrective and preventive actions? Scope Management What is the difference between Validate and Control Scope? Scope Management What is the relationship between Validate and Control Scope? Time Management What 4 techniques are used to review the schedules performance? Time Management What is Trend Analysis? Quality Management How does Statistical Sampling work? Quality Management What is the rule of 7? Quality Management When is a project considered out of control? Quality Management When is the 80/20 Rule used? Quality Management What are the outputs of Control Quality Process? Quality Management Who created Plan-D-Check-Act? Communication Management How are change requests an output of Control Communications? Risk Management Who performs Risk Audits and why? Risk Management When should the risk register be reviewed? Procurement Management When, how and why does a contract change? Procurement Management What is the difference between express and implied warranties? Procurement Management What are the inputs to Control Procurements? In January 11th 2016 the PMI added tasks 6 and 7 to the list of expected tasks in the closing phase. You can read the impact of these tasks additions here. Task 1 Obtain final acceptance of the project deliverables from relevant stakeholders. Confirm the project scope and deliverables were achieved. Task 2 Transfer ownership of deliverables to assigned stakeholders according to project plan. Facilitate project closure. Task 3 Obtain financial, legal and administrative closure in order. Communicate formal project closure and ensure transfer of liability. Task 4 Prepare and share final project report according to communications management plan. Document project performance and evaluation. Task 5 Collate all lessons learned created during project and do a final project review. Update organizations knowledge base. While I was studying for the PMP exam I kept a list of terms and definitions on the Closing phase for studying purposes. I turned this list into a study list to test myself by domain same as the exam is structured. Integration Management What is the main output of Close Project or Phase? Integration Management Who has authority to close project? Integration Management What are requirements to close project? Procurement Management When do you use a Procurement audit? Procurement Management What is administrative closure? When taking exams try to recreate the exam experience by setting aside 2-3 hours with no access to phone or internet. Take scheduled breaks which we outlined in the exam day plan. This is our very own exam created after I actually did the exam so I tried to include as many exam question topics as much as I could. I tried to cover everything from the above study lists so please leave me know what you think in the comments section after you complete the practice exam. As Earned Value Management is one of the most important sections of the exam it is crucial being able to answer any type formula question. Once you can get top results in this 15 question exam you will be ready to answer any EVM question. Really difficult test but helped me identify new definitions and areas I hadn’t previously heard about. Oliver Lehmann was one the first to create a PMP practice exam online and has been teaching project management principles for over 10 years. Oliver also has a LinkedIn group well worth joining. This was one of my favorite test exams due to the feedback provided. It breaks down answers by process groups so you know where your weakness are to focus on. I only took this exam once due to time constraints but it identified that I was very weak in the initiation process group so I focused more on it and ended up getting Proficient in the area. Great simulator for emulating the actual exam and good indicator on your ability to pass the real exam. You can also get a second free exam by using their referral system and sharing within your networks. (You can easily just create other accounts with the referral link which will give your original account access to the second exam). A really good simulator with good feedback. This is a good exam to practice your exam strategy and taking advantage of the good simulator. Not the most difficult test but is a complete 200 question exam which helps gauge your level. I did the test with the book and online, the book is a great way of learning fundamentals. Has some repeat questions and not extremely difficult. Tutorial Point also provide a comprehensive study material people find useful which is worth checking out. Personally didn’t like the way questions divided into 3 sections and never completed the exams. Really close to the actual PMP exam besides some obvious grammar mistakes. Really beneficial and should be a must for any PMP taker. You do need to register to take the exam though. Not exactly like the exam format but hard questions which you will have to rely on your knowledge more than knowing how to answer PMP questions. This is the biggest difference and without a doubt the most important thing you can do to help pass the exam – create a test plan so you have milestones breaking up the exam so you know when to take breaks giving your brain rest which is a must for a 4 hour exam. The plan is as follows…. 08:45am Start Tutorial – All you need to do is click start the system is extremely straight forward to use so you can use this 15mins for writing down all your notes. Do not take for granted the importance of giving yourself a break it gives you time to gather your thoughts and re-motivate going into next round of questions. When attempting the exam I planned on reviewing all 200 questions but I only ended reviewing the marked questions so I recommend marking any question you have any doubt over. One day of exam you need arrive one half hour before your scheduled examination. You must sign in, present your identification and provide your unique PMI identification code that was emailed to you. If your government-issued identification does not display a photograph or a signature, a secondary form of identification may be used, which includes a photograph and/or signature (whichever is missing from the government-issued identification), and your name printed on the identification. All identification must be current (not expired). If the test centre administrator feels you have broken one of the rules stated below they have the right to dismiss you from the examination. Using or attempting to use someone else to take the test. Failing to provide acceptable personal identification. Having access to, or using, notes or any prohibited aid related to the test. Creating a disturbance (disruptive behavior in any form will not be tolerated; the test administrator/supervisor has sole discretion in determining whether specific conduct constitutes disruptive behavior). Communicating, in any manner, with another person other than the test administrator/supervisor or proctor about the test during the administration, including attempting to give or receive assistance. Attempting to remove scrap paper from the testing room, or tearing the scrap paper. Eating or drinking in the testing room. Leaving the testing room or test center vicinity without permission. Removing or attempting to remove, examination related material, or portions of a test in any format from the testing room. Engaging in any dishonest or unethical conduct, such as cheating. This will be reported to the PMI who can cancel your exam scores, bar you from test centres. If your scores are cancelled your fee will not be refunded. For more information check out the official PMI Exam Scheduling Instructions. When you attempt the PMP exam you will have an opportunity to take a tutorial which is 15 minutes long. Use this time to write up all formulas and study notes you have learned off. I wrote up 3 things which took 14 minutes…. All formulas – It is a must to learn off the PMP formulas and at very least learn all the earned value management formulas. It is crucial to be able to read the CPI & SPI to determine if project behind/ahead of schedule or under/over budget. The easiest way to remember this is high is good and low is bad! Process Group Table – This can be time consuming to learn so depends on how much time you have available if it is reasonable for you to learn. I only referenced it maybe 5 times total in the exam to clarify next process or help figure out an input/output. I created a post on how I quickly learnt the process group table and so can you here. You have 3 years before your PMP® certification expires. Within these 3 years you need to accumulate 60 professional development units (PDUs). If you have not accumulated the 60 PDUs you cannot renew your certification. If you have not accumulated the PDUs and renewed within 3 years your credential will be suspended. You will then have one year before you credential expires completely. A PMP PDU is a personal development unit collected by project management professionals. PMPs need to collect PDUs to renew their certification. One PDU is earned per one hour spent in structured learning activity. Originally the purpose of PDUs was to keep PMPs up to date on latest project management methodologies and standards. Now as of of 1st December 2015 they are more aligned with employer-identified skills to ensure PMP designation holders are equipped to remain relevant and competitive by developing these employer demanded skills. The new changes put priority on specifically Education PDUs which now are based around the PMI Talent Triangle. 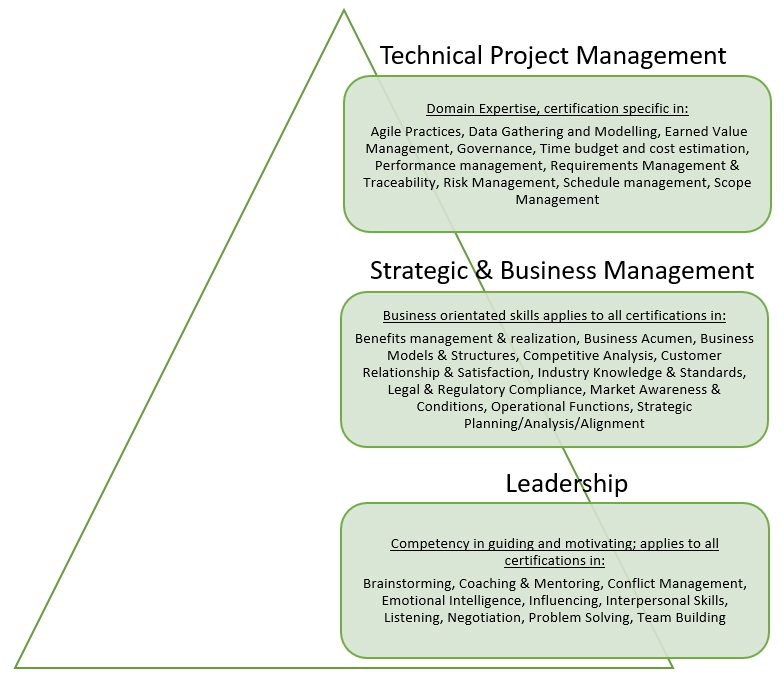 The Talent Triangle consists of three knowledge areas Technical, Leadership and Strategic/Business skills of PMI project managers. For more information on the PMI Talent Triangle click here. These 3 skill areas make up the PMI talent triangle which Education PDUs need to work towards improving in project managers. 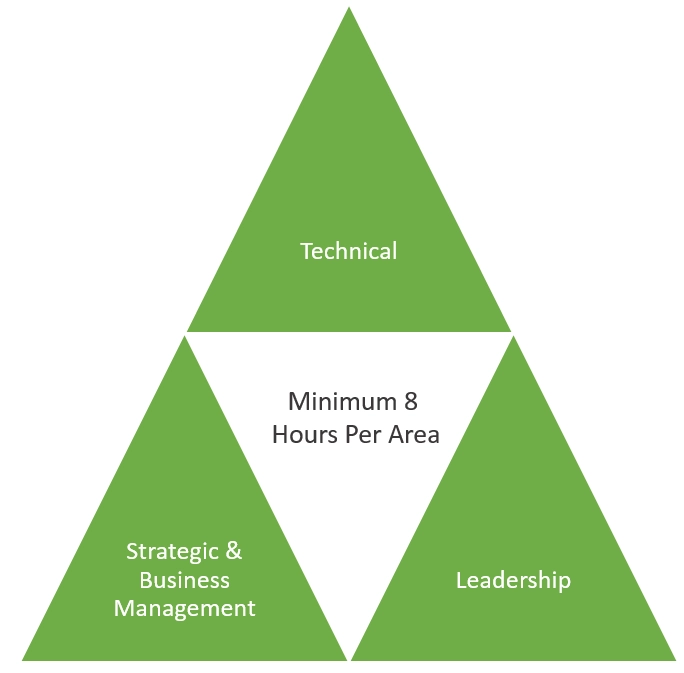 This is completed by ensuring Project Managers have a minimum of 8 hours of education in each area. Project Managers can complete the remaining 11 hours in any area they choose and there is no maximum for education PDUs accumulated. A PDU is defined by the PMI as a measuring unit for structural learning in Project Management. One PDU is earned per one hour spent in structured learning activity. There are 6 categories of PDUs broken into 2 categories. Earn PDUs by attending educational courses offered by PMI’s Registered Education Providers (R.E.P.s). Earn PDUs by attending events offered by the PMI such as seminars and conferences. Earn PDUs by attending relevant educational course offered outside of PMI. PDU Example: If not a college course it can be training provided by employer or another professional or membership association. PDU Rule: 1 hour of instruction related to project management, project risk, project scheduling, or program management equals 1 PDU. You can report PDUs in 0.25, 0.50 and 0.75 increments. Only modules related to project management can go towards PDU not entire course. Audit Requirements: Transcript or grade report with a pass mark. If non-PMI R.E.P you will be required to provide registration form, certificate with the syllabus outlining content and qualifications of instructor. PDU Explanation: You have 2 options to earn Category C PDUs by completing qualifying activities which are relevant to project management, project risk, and project scheduling or program management, meet a specified purpose and use knowledgably resources. Audit Requirements: Evidence supporting your reported learning project, including notes from and dates of discussion or reading. PDU Explanation: You can earn PDUs for creating new knowledge for a topic related to project management. Both time preparing/creating this knowledge and time to present it can be claimed for PDUs. PDU Example: Examples of Category D would include…. Audit Requirements: Copies of publications, sample educational materials or course agendas. PDU Explanation: You can earn PDUs for volunteering (non-compensated service) project management, project risk, and project scheduling or program management services to a no-employer or client. PDU Example: All work must be legally recognized as non-profit, not-for-profit or charitable groups or organizations. Examples of Category E would include…. PDU Rule: 1 hour of volunteer (non-compensated) service equals 1 PDU. PDU Explanation: You can earn PDUs for working as a project manager. PDU Rule: You may claim 8PDUs per 3 year cycle. When Can I Start Earning PDUs? You can immediately log on to your PMI account and click “renew” to begin your PMP / PMI-ACP re-certification process. The process is in fact quite a simple one in which you are asked to check your information, agree to the terms and conditions and pay the required re-certification fee of US$60 for a PMI member and $150 for a non-member. Then you will have your certification extended for 3 years from the original expiry date of your certification. For example if your new PMP certificate expires on July 2019 and you complete the all the required PDUs in 2017 you will have until July 2022 to complete another 60 PDUs to renew again. You have two options for submitting a PDU claim you can either do it online or download the PDU activity reporting from (PDF) to complete and submit to PMI electronically. Step by step instructions provided by PMI here! For a small number of randomly selected cases, PMI may request for an audit to verify the information provided during PDU requests. So it is important to retain the evidence of PDU qualifying events. Also PDUs can be submitted up to the end of next calendar year after the completion of three year CCR cycle in which the PDU accruing event occurred. It is highly recommend record all audit requirements as you earn PDUs just as a precaution to getting audited. All requirements are highlighted above under each category decomposition in the PDU category article here. If So Please Comment & Share, Thanks!